Brad Parks is the only author to have won the Shamus Award and Nero Award for the same novel. 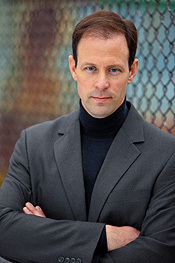 That book, FACES OF THE GONE, introduced Carter Ross, the sometimes-dashing investigative reporter, who has gone on to star in EYES OF THE INNOCENT and THE GIRL NEXT DOOR, which reached No. 3 on the Baker & Taylor Fiction/Mystery Bestseller List. The series, which Shelf Awareness has called "perfect for the reader who loves an LOL moment but wants a mystery that's more than empty calories," has earned starred reviews from Library Journal and Booklist. It will continue with THE GOOD COP (due March 5, 2013) and a fifth, as-yet-unnamed installment. Parks is a graduate of Dartmouth College and spent a dozen years as a reporter for The Washington Post and The (Newark, N.J.) Star-Ledger. He is now a full-time novelist who lives in Virginia with his wife and two small children.